Fuerteventura is one of the most popular destinations among the Canary Islands. In particular, kitesurfers appreciate this island of 1,660 kilometres in size. This is because it is swept by a strong wind. Fuerteventura is home to several world-renowned spots that have become over the years the meeting place for athletes from all over the world. Some of these spots are in the north of the island, such as Corralejo and El Cotillo. Others are located in the south of Fuerteventura, such as the Sotavento lagoon and Costa Calma. These two are relatively distant since they are an hour and a half away by car on average. Fuerteventura is only 97 kilometres from the African coasts, more precisely from the Moroccan coast. This implies that the “chergui”, a very hot wind from the Sahara, blows almost permanently. As a result, the island is swept all year round by a strong wind, which is perfectly suited to sports enthusiasts such as kite surfing. This is why the north of Fuerteventura has become over the years the essential meeting place for kitesurfers of all origins. It is home to a number of famous spots. If those of Flag beach and El Cotillo now have a worldwide reputation, other spots remain confidential. This is the case of Majanicho, which has the advantage of being accessible all year round. Even if it is not the best spot on the island, it perfectly meets the requirements of experienced surfers. In addition, it has waves that are mainly straight. As for the best wind direction, it is from the northeast and east. As for the best orientation of the swell, it is normally North, Northwest and West. The other spot that deserves to attract the attention of kiteurs in the north of Fuerteventura is Rocky Point, which is one of the many beaches in Corralejo. It is in spring and winter that it provides the best conditions for kitesurfing. This spot is especially designed for experienced surfers. It is during high tide that they enjoy playing with the wind and waves of Rocky Point. And if the best wind orientation is northwest and west, the best orientation of the swell is north, northwest and west. The city of El Cotillo is located in the northwest of the island of Fuerteventura. It shelters the superb playa del Castillo, which extends over a length of one kilometre and is surrounded by two cliffs. This is a spot that is very popular with kitesurfers, even if they have to go through a small shore break before accessing it. This explains why it is difficult for beginners to enjoy this spot. However, the pleasure is at the end of the pain because the spot is quite large and there are not many kiteurs in the water. It should also be noted that they generally have to share the spot with the surfers. However, cohabitation is quite easy. Indeed, most of the time, the first part of the beach is reserved for kitesurfing while the second part is for surfing. If the best wind orientation is North and North-East, the best orientation of the swell is North, North-West and West. It is during high tide that it is advisable to practice kitesurfing in El Cotillo. Indeed, if the swell is too large, the waves may close and the shorebreak can become quite violent. In addition, the presence of many sharp lava rocks in the water and on the beach encourages great vigilance. Otherwise, you may be injured. This makes the specialists say that the spot of El Cotillo is much too technical to allow beginners to really tease the wind and waves. Located about twenty kilometres from El Cotillo, Flag Beach is the other famous spot in the north of Fuerteventura. It is located opposite the island of Lobos, which makes it a protected area. This means that this spot is perfect for kitesurfers of all levels. Indeed, the waves break in all directions and in different peaks all along the beach, which allows every kitesurfing enthusiast to enjoy themselves, whatever their experience. Because even if you are just starting out in this discipline, you can easily access water. 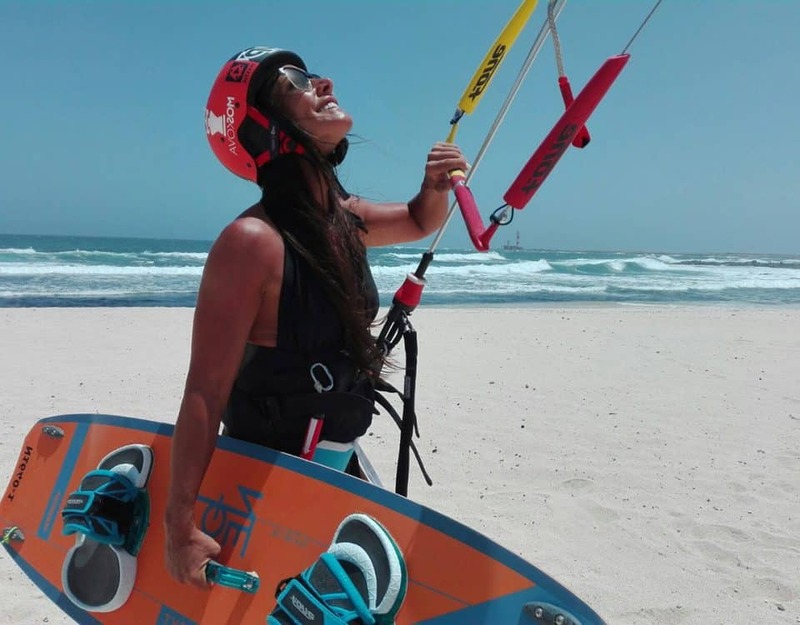 As for the more experienced kitesurfers, they can continue the adventure to the island of Lobos which is located just in front of the spot. However, it is recommended to be careful when you enter the water. Indeed, at low tide, volcanic rocks appear at the surface of the water. This means that you may cut yourself if you are not careful. In addition, the Flag Beach spot is the only one in Fuerteventura with a safety boat. However, you must subscribe in advance, otherwise the bill may be very high if you have to use it. In addition, unlike the El Cotillo spot, Flag Beach has a bar on the beach where it is possible to prolong the pleasure between sportsmen while admiring a superb sunset. 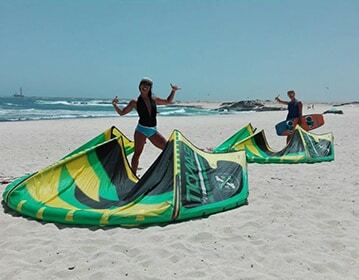 If you are just starting out in the sport, know that a kitesurfing centre is a stone’s throw from the Flag Beach spot and you can take your first steps and even rent the appropriate equipment. Masters swimmers are also available to help you if necessary. As for the best wind direction at Flag Beach, it is North, Northwest and Northeast. As for the best orientation of the swell, it is from the north and northwest. In general, waves are surfed from the left. Thus, this spot is accessible to all kitesurfers all year round.